The Technology Strategy Board (TSB), that together with Energy Saving Trust, funded the Retrofit For the Future programme and the accompanying blogging network managed by TJW Media called Retrofit Diaries, has published its final report on the two year programme. According to the TSB ‘Retrofit for the Future' showed that the retrofit industry in the UK can deliver deep carbon reductions with existing technologies and practices without compromising the comfort of residents. The report, based upon analysis of 100 homes across the UK, showed a strong correlation between good air-tightness and lower CO2 emissions and identified practical considerations for more effective retrofitting in the future. The project was designed to address the challenge laid down by the UK Government's target to reduce greenhouse gas emissions by 80% by 2050. By analysing data from over a third of the properties the report identifies the CO2 emission reductions achieved by each project initiative. Retrofit for the Future catalysed the retrofit of over 100 homes across the UK, with an ambition of achieving an 80% reduction in the in-use CO2 emissions of each property. Coordinated by the Technology Strategy Board , the Retrofit for the Future competition encouraged collaboration between housing providers, designers, contractors and researchers, and has helped to stimulate new business opportunities in the retrofit market. Retrofit Diaries was a network of over 100 websites for project participants to record the progress of their retrofit builds - that achieved 100% uptime for the two year duration of the project and was user-friendly in way for builders, architects and project managers that was not achievable should they had been forced to use TSB’s own _connect platform. Extracts from some of the more revealing Retrofit Diaries have since been archived by the Energy Saving Trust. A feature on the TSB Innovation in Action section of its site, reported that many small companies have grown significantly as a result, and in several cases they have been able to take innovative products or processes to market after demonstrating their effectiveness through Retrofit for the Future. 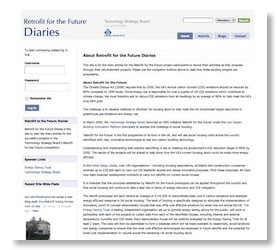 Retrofit for the Future Diaries is the site to read the diary entries for the successful projects in the Technology Strategy Board's Retrofit for the Future competition. About Retrofit for the Future: The Climate Change Act (2008) requires that by 2050, the UK’s annual carbon dioxide (CO2) emissions should be reduced by 80% compared to 1990 levels. Home energy use is responsible for over a quarter of UK CO2 emissions which contribute to climate change. We must therefore aim to reduce CO2 emissions from all dwellings by an average of 80% to help meet the UK’s long term goal.